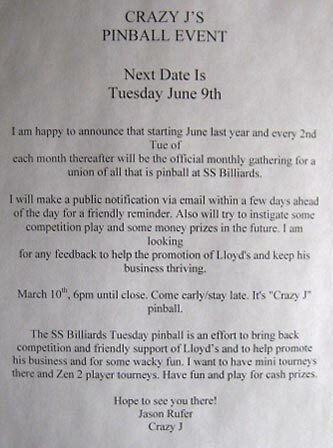 The Pinball Picnic was held at SS Billiards. The owner, Lloyd, explained that the Picnic was an attempt to trying something new and see if anything from the event would fit well in the upcoming anniversary party. Lloyd explained that the first party evolved accidentally and said, “You don’t know what is going to work… you keep trying”. From the copy of the email announcement below, you can’t quite tell that the arcade was under normal operations until the free event, but you can see other details. 5pm practice. 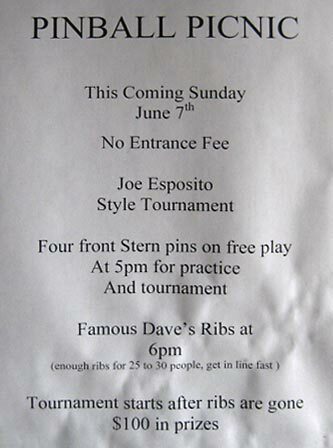 6pm Famous Dave’s, followed by a $100.00 cash prize Joe Esposito style tournament. At 5pm front four Stern pins ( Batman, Lord of the Rings, Wheel of Fortune, and Spiderman ) will be set on free play for practice and tournament. The rest of the business will be open and operating just like any other day. 6pm Famous Dave's ribs are delivered. I have no idea how many people will attend, so the first 25 to 30 in line get ribs. 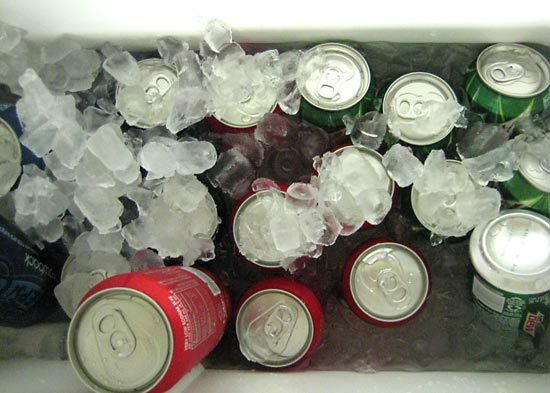 I'll have a cooler with pop on hand to quench thirst. 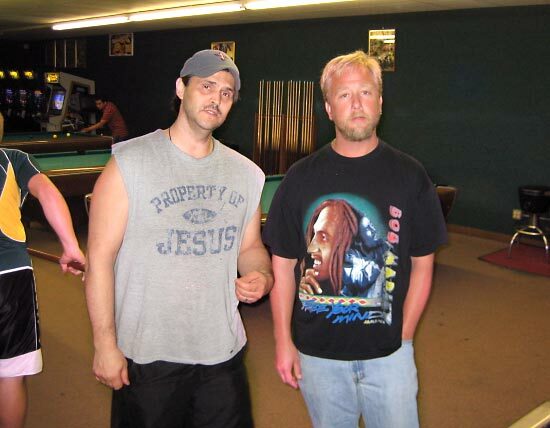 After the food there will be a Joe Esposito style tournament, with $100 in prizes. 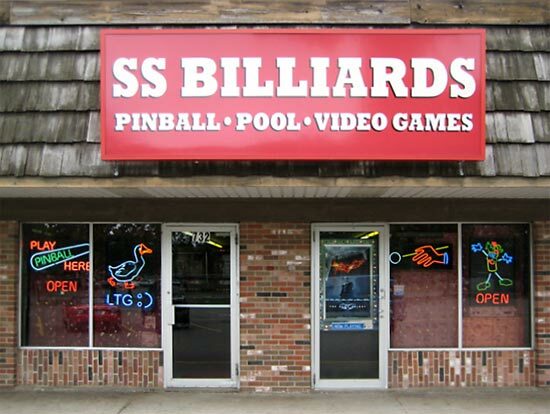 This will mark the start of Summer pinball fun at SS Billiards. 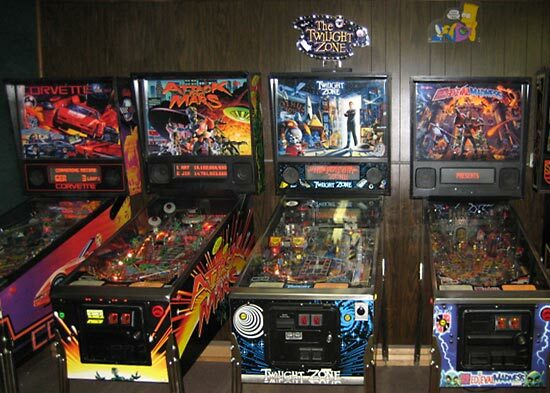 A great place to play pinball. I am going to be trying a few different things this Summer, to help with launching a new event on my 37th September 20th. 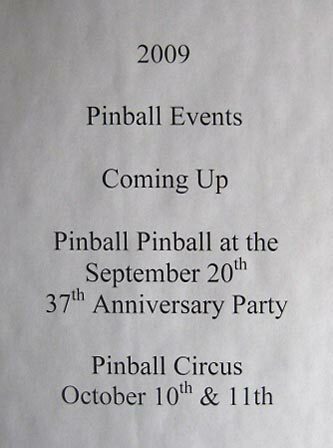 And on October 10th and 11th Pinball Circus http://www.pinballcircus.com/ two days of a lot of fun. 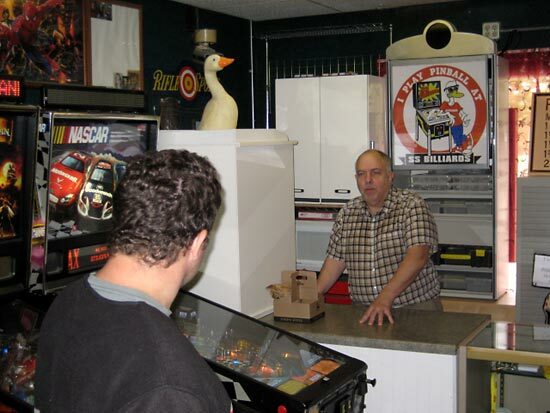 Don't forget we are open 360 days a year for your pinball enjoyment. 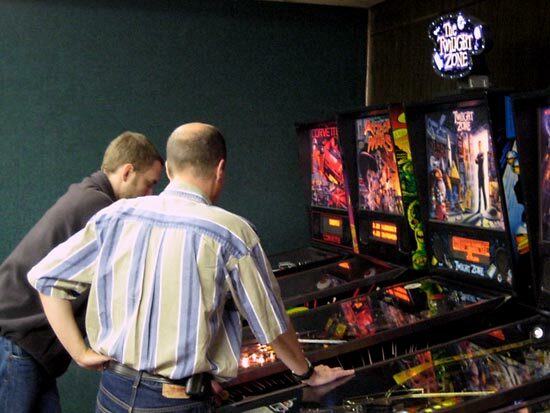 A few Pin-heads came in early, while the arcade was operating under its normal Sunday mode, just to get in a few hours of pinball on the games they love. 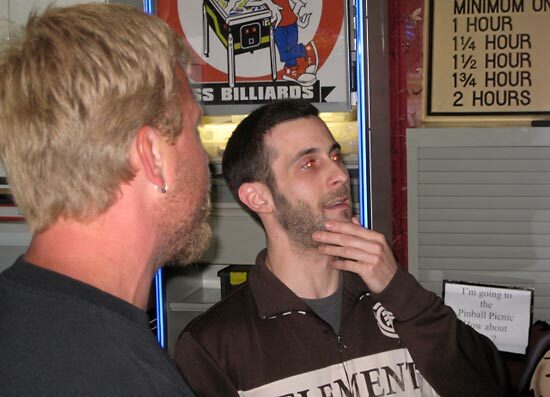 Included in the event were some literal first time “newbies” and previous tournament attendees. 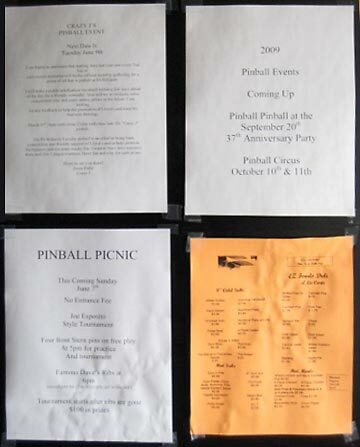 The line-up of pinball machines available for free play at the Pinball Picnic is shown below in order of grouping. 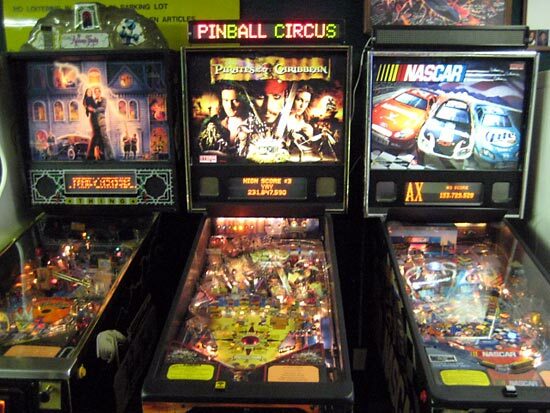 The other pinball machines available for play all day are pictured and listed below. 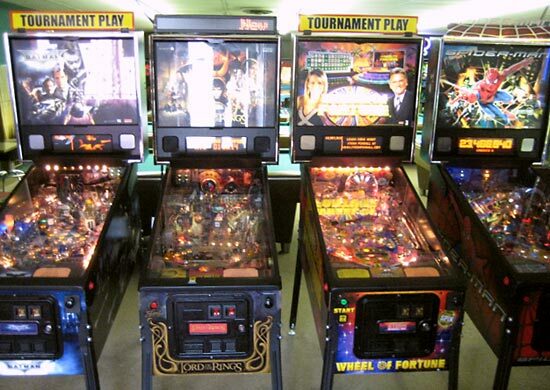 Besides the tournament games up front was a three pack of pinball machines. Not pictured here are three pinball machines: the game which is for sale Excalibur, and a collector’s Global Warfare, plus a surprise game. Lloyd had the tournament games on free play by 5:00pm. Many new and seasoned players took full advantage of the latest Stern titles on free play. Food was delivered very close to 6:00pm. There were plenty of ribs for everyone and Lloyd even had an entire cooler of pop available to picnic attendees. Due to the fact that Joe Esposito was involved in a car accident just days before the tournament, the start time was postponed from 6:30 to 7:00pm. The extra half hour was a respectful attempt to see if Joe could make it at the last minute. Alas, he could not. Luckily for Lloyd, Ryan Trego stepped up and offered his services. Ryan hatching his evil plans … muahh … muahh. All kidding aside, Ryan did a phenomenal job getting the tournament started! Ryan personally made sure that everyone in attendance at 6:30pm had a chance to sign up. He collected the names of sixteen people and put the names in Lloyd’s “automated drawing machine”: a.k.a. a bucket. 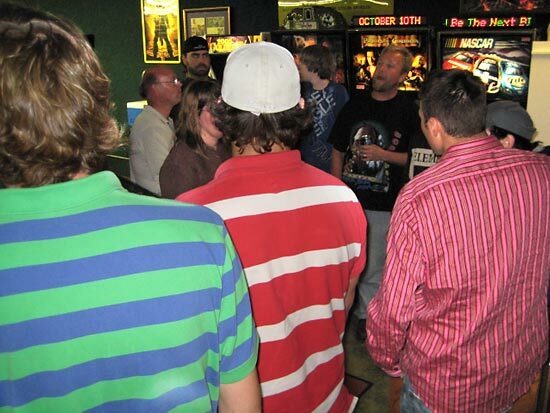 At 7:00pm, players were beginning to be paired up by luck of the draw. 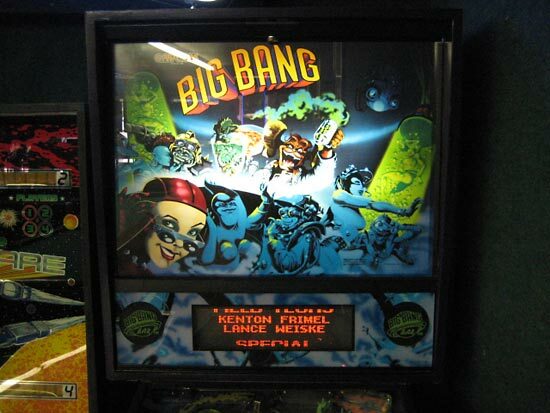 From the four pinball machines available for tournament play, the game each pair played was decided by player agreement or flip of a coin. Winner of each round was decided by best two out of three. 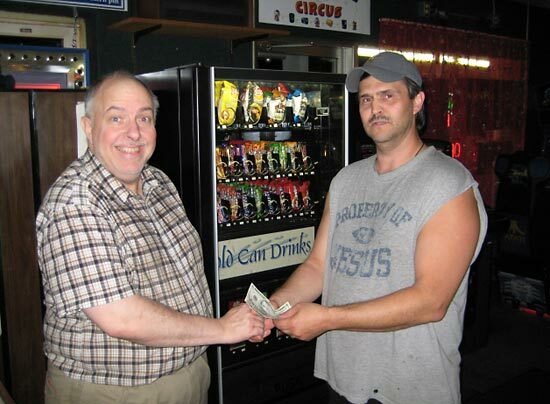 Player order was also decided by player agreement or flip of a coin. 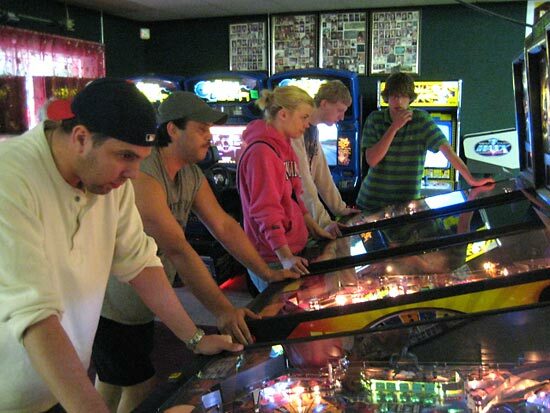 The Joe Esposito style tournament at the Pinball Picnic started with sixteen players. Ryan kept the pinball tournament running smoothly as the number of competitors decreased to eight, then down again to four, and finally down to the last two contestants. 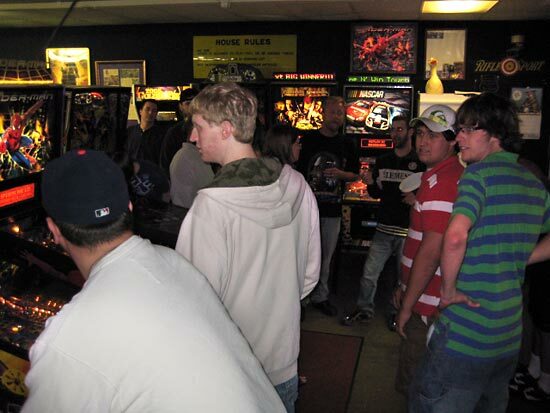 During the tournament, one of the newbies helped rally his friends with a cry of “PINBALL!” The rally was so energetic that the majority of the crowd could not help but repeat the explication. 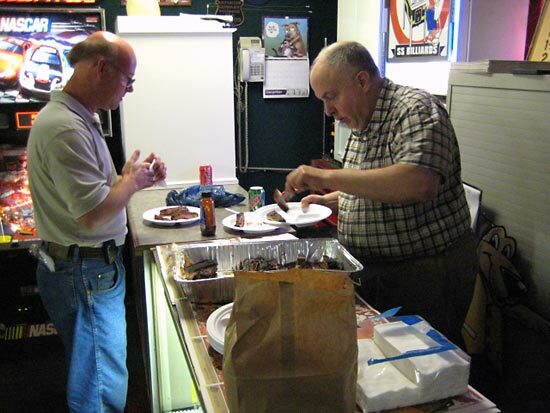 By just a few minutes after 9:00pm, The Picnic came down to the final round between Dave Gorka and Jim Stoddard. 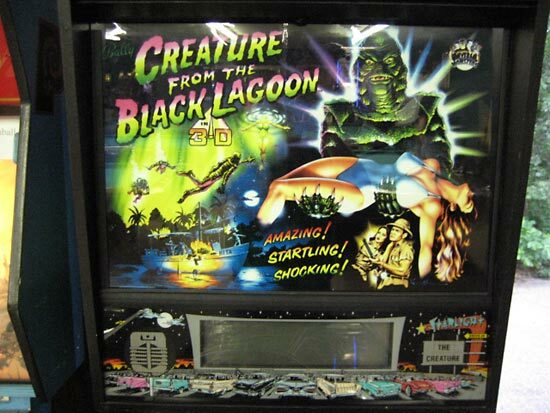 As a surprise, the final round was played on Creature from the Black Lagoon. During the day, several in attendance (including a few of the newbies) had lamented that, “Creature had not been turned on”. The reason for the non-use was that the game was saved as a planned surprise on which the two last contestants would compete. 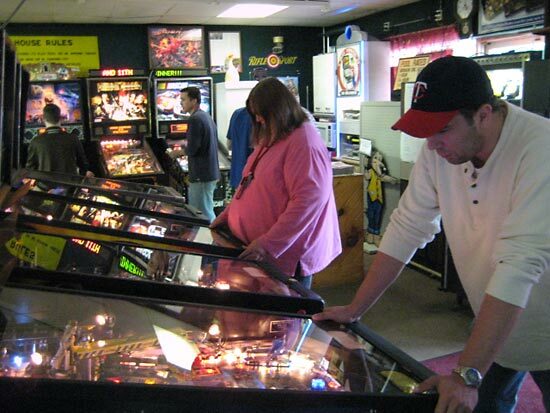 During the entire day, not a single malfunction or even a struck ball was reported on any of Lloyd’s pinball machines; tournament or regular. The final round was played out in two games, but game play lasted until 9:45pm. The last round was won by Dave. 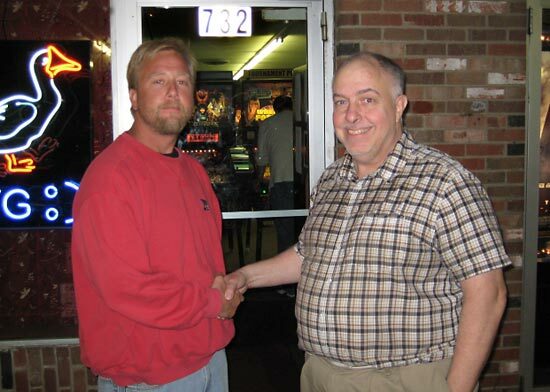 Ryan immediately congratulated the Pinball Picnic tournament winner, Dave! Because of the format, Lloyd had chances to walk around. The chance gave him opportunities to: observe people having fun, talk to people and do a little cleaning up as he went along. So for once, there wasn’t much clean up for Lloyd to do after the event. 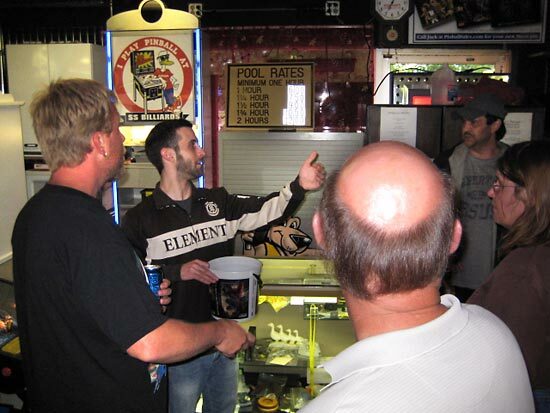 Lloyd thanked all those who had contributed to his latest pinball event. His appreciation was shared.